In Q4 2011, we started tracking over 200 twitter accounts dedicated to customer support, over and beyond financial services, all across industries, wordwlide. 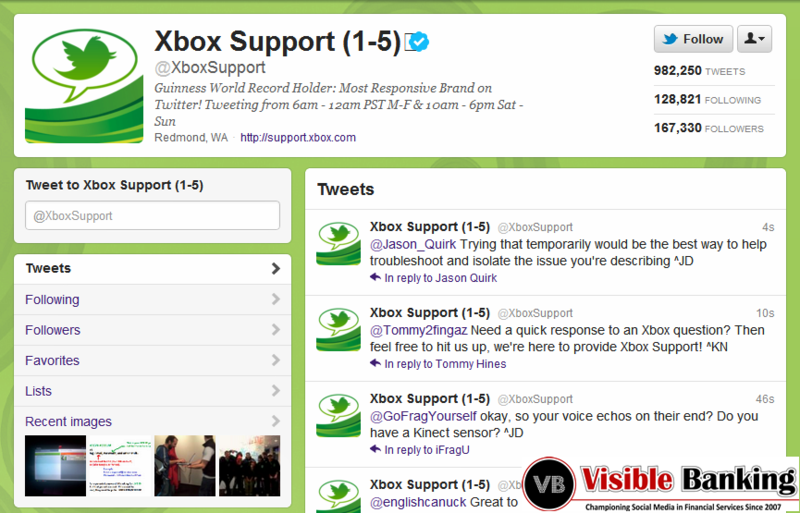 XBox Support is the most active twitter account for customer care with over 1,000 tweets daily. Since March 2009, my team have been tracking and benchmarking how the global financial services industry is using social media to engage with their customers and their markets. We now track over 1,700 twitter accounts in 78 countries. I invite you to check our Top 10 most active customer care accounts as of 1st March 2012. It is one thing to have a twitter account, but tweeting and engaging with your audience is another matter. As you would expect, the accounts dedicated to customer support tend to always be the most active accounts from the corporate world and brands in general. I invite you to watch our Top 10 countdown led by XBox Support with an astonishing 1,030 daily tweets on average. I invite you to check our other twitter and facebook Top 10s. I invite you to express your interest for our global report on the topic of customer care on twitter. Send us an email to Enquiries@Visible-Banking.com.